2017 is set to start off in a spectacular fashion on January 4th with nature’s “fireworks” display of the Quadrantids. The Quadrantids meteor shower is anticipated to best be seen from the Northern Hemisphere where the radiant point of the shower will be far to the north on the sky’s dome. The waxing crescent moon will exit the sky during evening hours so watching the meteor shower in the early morning hours is your best bet. It’s predicted to peak between midnight and dawn. Typically the Quadrantids have a narrow window where it peaks, which is easy to miss. Unlike other meteor showers that can remain at their peak for 2-3 days, the Quadrantids will only last for a few hours. The Quadrantids were named after a now obsolete 19th-century constellation, Quadrans Muralis. The now kaput constellation was left off of an International Astronomical Union (IAU) constellation map that was created in 1922. The meteors appear to radiate from the point where this constellation once was. 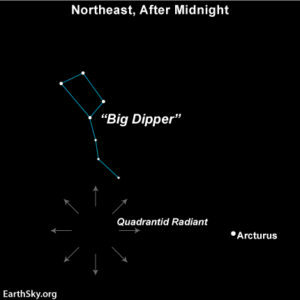 To find the radiant point, look for the Big Dipper and the bright star Arcturus, which you can see in the image to the right. 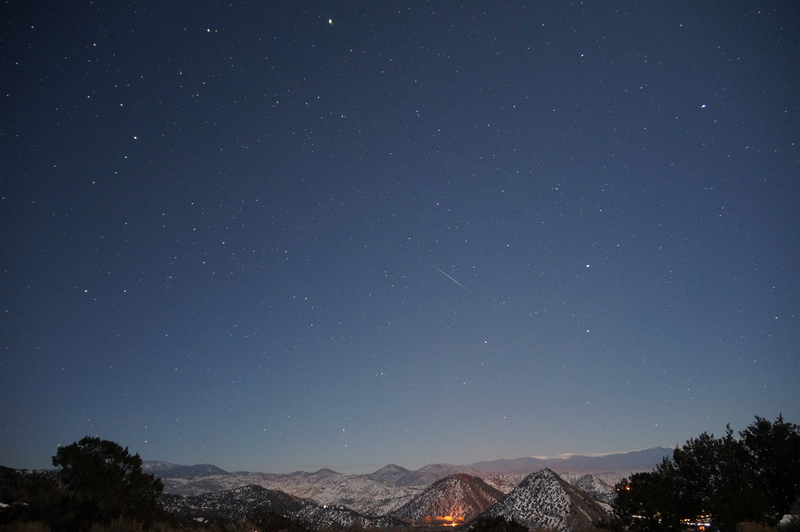 What is the best way to watch the meteor shower? Be on the lookout between midnight and dawn on January 4th and it is suggested to lay on the ground and look towards the North. Previous post: Why is Blue Light at Night Bad?